There is a bathroom with a toilet/shower, a second toilet and a bathhouse. This property is very different from any other you could rent and it makes it unique and unforgettable. If you look for something different it is the place to choose. Very unique and was one for the books. Has everything you need awesome outside inside flow - It has many features that make the place feel like a great space to be in. Great for friends to catch-up. A lot of stairs but it didn’t bother me and my and friends one bit. Giles was very fast in replying to all questions (thankyou again) Overall an amazing and unique space to be in. This property was great! Perfect place to stay especially for those wanting somewhere for everyone to have their own space and yet come together in a few places to enjoy a funky relaxed atmosphere. The highlights were the retro decor, hydrotherapy pool, cinema room and bathhouse. The location was awesome, close to the city, the ocean, a great field directly across the road for outdoor games. I would highly recommend this property for all, but keep in mind to watch little kids on the stairs. It’s an extremely fantastic place to stay- the most special place I’d stayed I NZ. And all you need - superb equipment. I will come definitiv back soon to this special place. Got a warm welcome from the host and a wonderful and helpful introduction. Thanks so much. A fun and interesting place to stay! A fun and interesting place to stay! Perhaps not the most practical layout for young children (under 4 years), but they had a lot of fun and really enjoyed themselves! We all had a great time here - would be even better in Summer. Just a short walk up from the house is Carlucci Land, a very different Mini Golf experience and industrial sculpture fantasy land, well worth a visit. Brooklyn Village is just 3km away up Happy Valley Rd and boasts the fantastic Brooklyn Deli (for fresh bread, coffee and brunch), the Salty Pidgin bar and restaurant, Caribe Cafe (coffee and jerk chicken wraps), Jo's Pies (coffee and proper pies). Brooklyn also boasts the art deco Penthouse Cinema & Cafe plus two local convenience stores, takeaways (Burger Wisconsin) and a chemist. Although you may prefer to just stay at the house, of course there are plenty of other things to do around Wellington! A must is to visit Te Papa museum and Weta Cave in Miramar, and the many independent galleries and bookstores. If there is anything that you might be interested in let us know and we'll be more than happy to help you with your travel and activity preparations. If you would like to take public transport, the bus leaves from just outside the house into Wellington City via Brooklyn or across the road towards Island Bay and costs $4.50 per trip, but less with Wellington's Snapper travel card. An Uber taxi into the city costs anywhere between $9-15 at standard rates, whilst a standard taxi between $15-20. 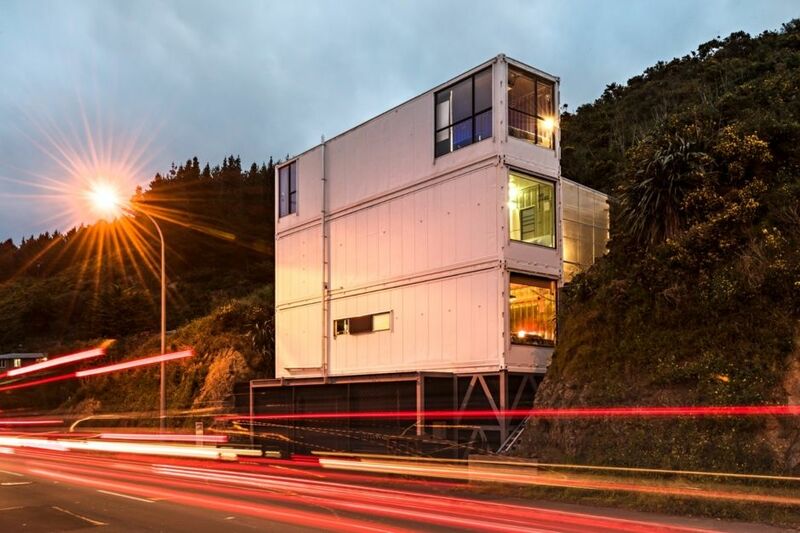 We have garaging for one car at The Wellington Container House, rental vehicles are easily rented from the airport or the city. Alternatively bicycle and scooters are also available to hire within the Wellington region. Wellington Airport is 9km away, or $25-35 Uber/taxi fare (around the beautiful South Coast.